Perfect for: It’s baked cheese. Any situation is perfect for baked cheese. This went down amazingly as a sharing starter on Saturday evening – and was by far the easiest of the three courses I made. Plonk it on a big platter with some warm bread (homemade, obviously) and people are more than happy tearing and sharing with gusto, accompanied by lots of red wine. Miss Muffett is a hard-rinded cheese which was easy to find in The Cheese Shop in Truro. I’d never had it before, so was pleasantly surprised by its pungent nuttiness, enhanced by Cornish honey and a sprinkling of almonds. I even used the leftover rinds in a quiche the next day; how’s that for resourcefulness? So, the recipe in the book advocated barbequing a shoulder of lamb outdoors on a roaring fire for a little while, letting it rest, then serving it up with lots of green summery veg. This, for obvious reasons if you’ve looked out of the window recently, was virtually impossible. Thankfully, realising this halfway through the week, I put a call-out on Twitter for recommendations from Cornish chefs as to how to make the most of a shoulder of organic lamb in mid-winter. I was answered by head chef at the Pendarves Inn – Allen Muriel – who suggested slow-roasting it with rosemary and plenty of garlic, onions and seasalt. It worked amazingly well, ending up as what was essentially pulled lamb, with the slower cooking time making it easy to prepare in advance and just keep hot until dinner time. This definitely benefitted the meat, and our enjoyment of it, far more than if I’d stuck to the very spring-oriented recipe, so I’m not seeing this diversion as a failure, more as a definite WIN. Tom Scade’s recipe for Barbequed Shoulder of Lamb is on page 85 of the book. It’s amazing the reaction you get if you put a bowl of jelly in front of a proper grown-up. Far from being a dessert I thought I may have to talk people into opting for (I’d also made brownies for the vegetarian in the room), the dinner guests pounced on Nick Barclay’s sophisticated take on a childhood birthday party staple, gobbling it up and asking for seconds before I’d even sat back down. It’s a really simple recipe, and one you can spend as much or as little time as you like on making look pretty. I did spend a while on presentation – inspired by a visit a couple of months ago to Merchants Manor, when Dale McIntosh served up these beautiful little jellies that had been set at a tilt in their glasses. Easier to recreate than it looks, happily enough. The Cornish Orchards Blush Cider doesn’t have too much of that sickly sweetness you get in, say, a bottle of Magners, and has a lovely, farmy, cidery tang to it that wards off any notion that this is a dessert for children. And before you start tutting at my raspberry usage – I actually got these from the Cornish Food Box Company shop weeks ago when Cornish raspberries were still around, keeping them in the freezer till I needed them. See? Totally winning this week. 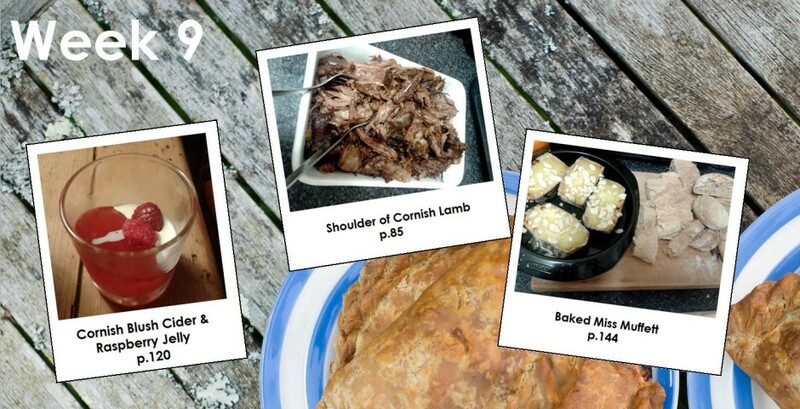 To buy a copy of the Great Cornish Food Book click here.